Many years ago I was dreaming and scheming to build my own business that offered outdoor therapeutic experiences for women. These programs are now coming to fruition. BUT building this dream is hard work, and takes some cash. Want to help without diving into your wallet? 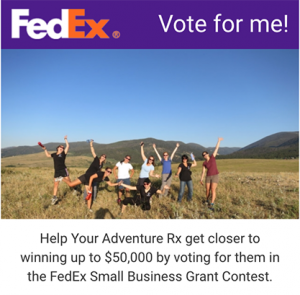 Then click on the link below and vote for Your Adventure Rx to win $50,000 in grant money from Fedex. This would be an awesome opportunity to build my business with the much needed capital to get the ball rolling! Diana is an Adventurer, Certified Therapeutic Recreational Specialist (CTRS), worked as professional outdoor recreation educator for people with and without disabilities for the last 20 years, traveled to over 20 countries and is also certified in Wilderness First Aid. She traveled the world solo before it was cool to do so, lived in the Alaskan bush, climbed many mountain peaks, biked numerous trails and paddled many lakes and rivers. Your adventure Rx provides recreational and leisure experiences that are holistic compliments to traditional mental health therapy options. Happy International Women’s DayIf I Can Do This, What Else Can I Do?